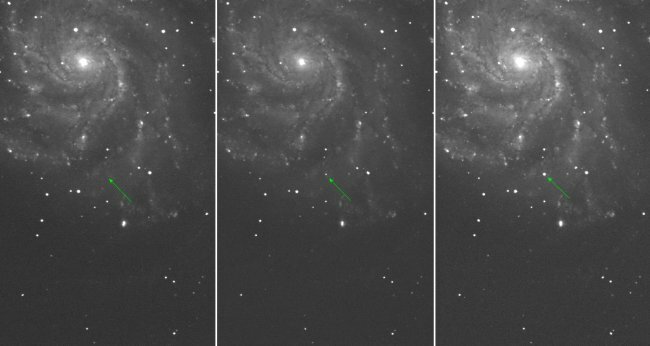 Image sequence of supernova explosion (arrowed) in galaxy M101, taken by the Palomar Transient Factory (PTF). Click here for bigger version [423KB]. Image credit: Peter Nugent and the PTF collaboration. Late on 24th August UK time, the LT responded automatically to an alert that a supernova had exploded in nearby galaxy M101, 26 million light years away. The object was detected on 24th August as part of the Palomar Transient Factory (PTF) sky survey when it was still only at magnitude +17. An email alert was sent out late on the 24th to all interested astronomers to train their instruments on the supernova as soon as possible, to catch it in its brightening phase. Mark Sullivan (University of Oxford) triggered the LT observations as part of a collaboration between LJMU and Oxford. After receiving the email alert he used the LT's Phase 2 User Interface on his laptop to submit a set of observations for consideration by the LT's autonomous robotic scheduler. Minutes afterwards, the scheduler decided by itself to perform these observations, swinging the telescope around to use FRODOspec to obtain spectra of the supernova. An automatic preliminary reduction of the data became available on the LT web site. LJMU astronomer David Bersier grabbed the spectrum and applied the final stages of the reduction needed to properly characterise the supernova. Under an hour after receiving the email alert, Mark had his data. This enabled him and others to determine the supernova was a type Ia. Type Ia supernovae (SNe Ia) have allowed astronomers to realise (in the late 1990s) that the expansion of the Universe is accelerating. This was done by looking at very distant SNe Ia. To better constrain this acceleration however, astronomers need to strengthen their understanding of SNe Ia in general; this can only be done by looking at nearby SNe Ia which can be studied in great detail. This particular event, dubbed PTF11kly, is thus an excellent opportunity to gather high-quality data about these exploding stars and refine our view of the Universe as a whole. The explosion fireball is still evolving and getting brighter. It's expected to reach 10th magnitude in the visual band in a few weeks, just observable therefore in good binoculars. Mark said later that the LT's rapid-response capability enabled "probably the earliest SN Ia spectrum ever taken". Remarking in the spur of the moment at how fast he received his data after the email alert, he wrote: "Wow, what fun! From an email alert to data in <1 hour". Says David Bersier: "It took about three hours to go from the discovery of the supernova candidate by a computer in California to establishing the true nature of this explosion. This is because a telescope like the LT is the ideal machine to respond to events like supernovae that happen without warning."